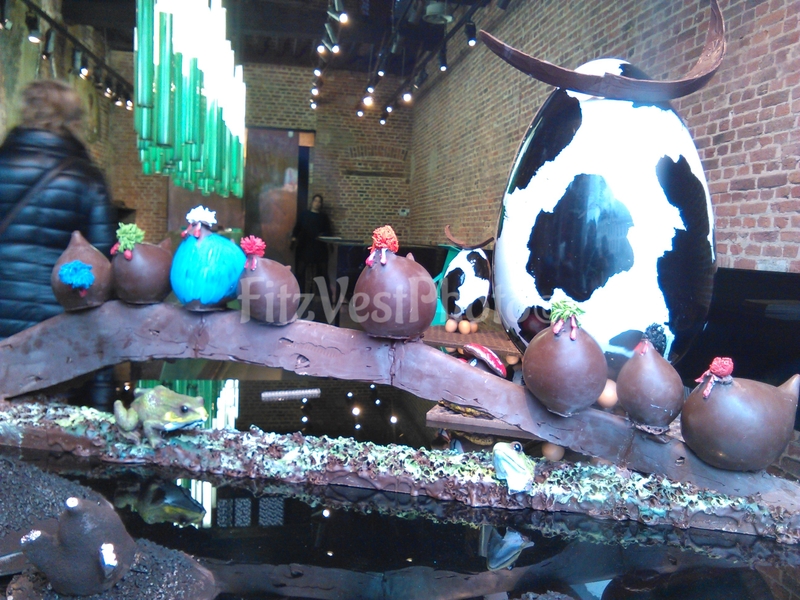 Belgium is known for their chocolate, and I was amazed by the decoration in the chocolate shops. If you want to try proper Belgian chocolate, you have to go to one of the chocolate shops and not just buy some from a tourist shop. Just the experience of going in to some of these shops. We came as Easter was slowly approaching and they had started to decorate their windows with easter chocolate. Chocolate figures painted in coloured chocolate looked like masterpieces, and you almost wanted to check if it actually was chocolate. Some of these shops almost seemed to treat chocolate like expensive jewellery. You walked in and choose a few flavour and they would neatly pack them in little boxes with ribbons and then into a little bag. I found it extremely fascinating. Chocolate window display. Chocolate painted with chocolate. Of course no trip is completely without trying some proper Belgian waffles. We never got to try the fries, which we will have to come back and try. Our aunt treated us to waffles at one of the chocolate shops that has a little cafe over it. What better place to get hot chocolate and waffles? Deciding we wanted to try both the liege and the brussels waffles, we got both and shared them. If you ask me which I prefer, it would be a hard choice. Though I would probably say the Brussels one. The Brussels is square and lighter, while the Liege one is thicker and round. If you buy a Belgian waffles somewhere not in Belgium, it is probably the Liege one. Our last day of sightseeing around Brussels we started out by going out to the Atomium. 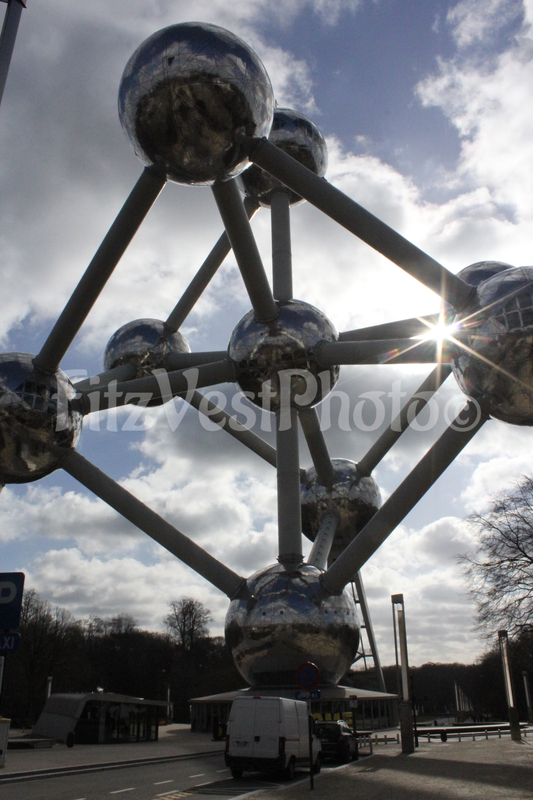 The Atomium is a structure built to represent an iron crystal, and made for Expo 58 (the World fair 1958). It was not meant to last, but as other structures from the world fair, like the Eiffel Tower, it still stands today. Though it seemed to have been half-forgotten for a while, it was reopened for the public in 2006 after almost 2 years of renovation. While you have to pay to get in, you get to travel through the different spheres. Some contain the history of the Atomium, some exhibits, and at the very top you get a 360 degree view. After having had our photo taken with Spirou, enjoyed the view, and looked at a lot of things from the 60s (orange was the colour), we headed back towards town. 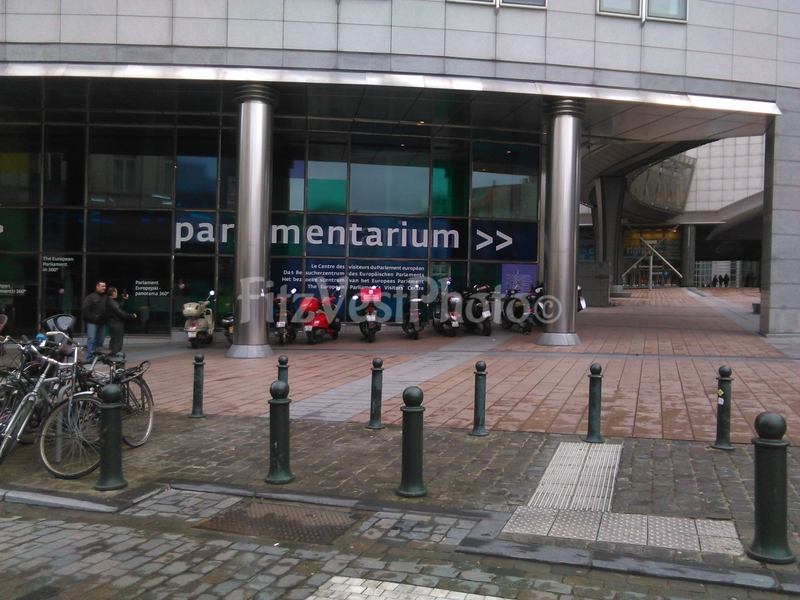 As the capital of EU (so to speak), you can go visit the Parliamentarium for free. Here you get a headset and can walk around and scan different codes and hear about what you’re looking at. We were delighted that we got it in Danish (being used to always just asking for English) and walked around hearing about how the EU came to be. You can read most of the things that they tell in your headset, but it is accompanied by photos and video clips. And then even have a special code to scan for the kids, that explains things at their level. If you want a very light version, you can also choose that one. You can then walk around hearing about the EU parliament now and the work they do.